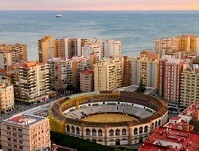 The Costa del Sol's gem Malaga is an increasingly popular destination in Spain's southern hotspot. Travellers flock to this sun trap every year for its stunning scenery, beautiful rustic dwellings, mouth-watering food and sparkling sea front location. Malaga is also a great base to explore the fabulous coastal towns of Marbella and Nerja. Flights to Malaga Airport are available with several airlines serving the enduringly popular Spanish holiday market, ranging from low-cost and regional carriers like easyJet, Flybe and Monarch to major global operators like British Airways and Iberia. Services to the city on Spain's south coast are available from London airports like Gatwick and Stansted as well as regional bases such as Birmingham and Manchester. Malaga Airport is the fourth busiest air travel base in the country after Madrid Barajas, Barcelona and Palma de Mallorca. It is linked to the city it serves by a number of transport options, including trains, buses and hire cars. Malaga serves as the gateway to the Costa del Sol, a stretch of coast in southern Spain that has long been one of the country's most popular sun holiday hotspots. It is the southernmost large city in Europe and is home to more than 560,000 people, making it the second most populous city in the Andalusia region and the fifth largest in Spain. With a history spanning some 2,800 years, Malaga is also one of the world's oldest cities. It was founded by the Phoenicians in the eighth century BC and spent centuries under the control of the Roman Empire and Arab civilisations before coming under Spanish rule in the 15th century. Travellers can learn more about the city's fascinating past by visiting some of its museums and historical landmarks. Malaga also boasts a colourful cultural heritage. Actor Antonio Banderas and celebrated artist Pablo Picasso are among the famous figures who were born in the city. There are many historical sights worth seeing in Malaga, one of the most significant of which is the Alcazaba, a Moorish castle dating back to the 11th century. The fort is notable for how well it has been preserved and the views of the city available from its highest points. Sightseers can also visit Malaga's Renaissance-style cathedral, which was constructed over a long period between the 16th and 18th centuries. As well as taking in the building's impressive interior and exterior elements, guests can see some of the grand artworks that decorate the sanctuary. Art lovers will not want to miss the Museo Picasso, which opened in 2003 in the city's Buenavista Palace and houses a collection of 285 pieces donated by members of the acclaimed artist's family. Malaga is also home to the most-visited museum in Andalusia - the Centro de Arte Contemporaneo, or CAC. The institution is home to an archive of works that represent a journey through 20th century art, with highlights including pieces by the likes of Louise Bourgeois, Damien Hirst and Juan Munoz. A trip to Malaga also provides the opportunity to spend some time relaxing on the beach. The nearest beach to the city centre is La Malagueta and there are more seafront locations - some of which are quieter and more picturesque - further east. Holidaymakers can either take a long walk along the coast to reach these beaches or catch a bus. One of the most memorable experiences on offer to travellers visiting Malaga is crossing the King's Walkway, a pathway situated high above the stunning El Chorro gorge about 50 minutes' drive north-west of the city centre. Malaga enjoys a subtropical Mediterranean climate, with some of the warmest winters in Europe. Temperatures can average about 17 degrees C from December to February. The destination has a long summer season offering warm conditions from April to November, with temperatures regularly climbing into the high 20s and low to mid 30s in June, July and August.